FORS is hosting a bespoke briefing session specifically to update its members based in Bristol. FORS – the Fleet Operator Recognition Scheme – Regional Briefing is due to take place in Bristol, on 6th November, and is part of a series of national events, staged to give members from each region the opportunity to engage with the FORS team, learn about its latest developments and ask questions. FORS is a voluntary accreditation scheme for companies operating any type of commercial vehicle anywhere in the UK or overseas. It promotes a singular ambition to drive-up standards in the road transport industry with respect to safety, efficiency and environmental protection. FORS members are encouraged to progress from FORS Bronze through to FORS Gold accreditation. The Bristol event will give members more information on the introduction of the new FORS Standard version 5 document – which sets out the requirements FORS members must meet in order to achieve and maintain FORS accreditation. The new FORS Standard was launched at the FORS Members’ Conference on 16th October and is due to be implemented in January 2019. 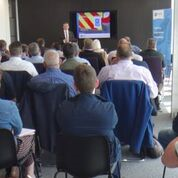 The briefing is part of a series of events held at key locations across the UK over the summer with a further six locations, including Bristol, hosting events this autumn. When the series completes in November, briefings will have also been held in Crumlin NI, Cardiff, Glasgow, Newcastle, Manchester, Birmingham, Peterborough, London, and Edinburgh.